If you can knit and purl, you can knit your very own socks. Each step – from casting on stitches for the leg to working the misunderstood Kitchener stitch at the toe – is broken down into its basic elements and illustrated with clear photographs and drawings. 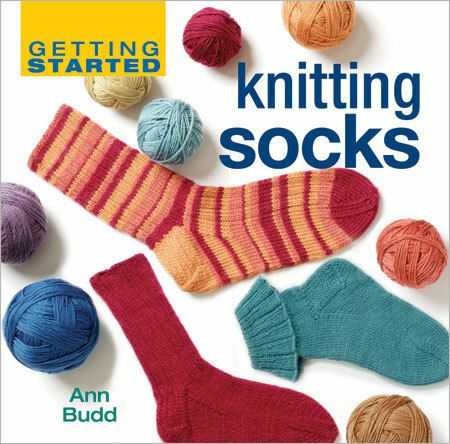 Along the way you’ll learn the fundamentals of sock knitting, a variety of ways to achieve similar results, and a host of time-proven tips that ensure success. In Getting Started Knitting Socks, you’ll find basic instructions for knitting socks at five different gauges and for five different sizes. Whether you want to knit a pair of delicate dress socks for your ten-year-old niece, a pair of sturdy book socks for your older brother, or a pair of bulky slipper socks for yourself, we’ve got your feet covered. If you get tired of the basic sock, add some color or texture, either by following one of the 16 patterns provided or by adding your own stitch pattern – dozens of rib, cable, and lace patterns are provided for your own experimentation.